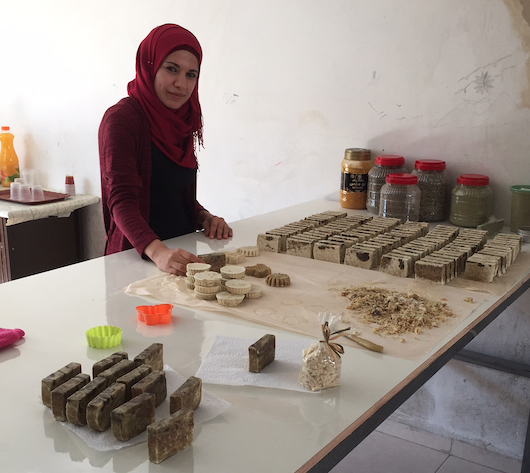 West Bank—Maysaa’, a 34-year-old single woman from the town of Tubas in the West Bank, first heard about the Near East Foundation’s Youth Agribusiness Partnership while she was working with a small group of women making soap to sell. Maysaa’ decided to apply to be a participant, because she felt it would be an excellent opportunity to learn how to generate and sustain her own income. The Youth Agribusiness Partnership project, implemented by NEF and funded by USAID, aims to bring about systemic change in the agricultural economies of Israel and the West Bank by providing agribusiness and entrepreneurship training for young Palestinian and Israeli men and women. The project selection committee chose Maysaa’ to be trained as part of the herbs cohort. During the NEF-led sessions she learned methods to develop and strengthen her skills and resources so she could establish and manage a business successfully. Through the program, Maysaa’ met several participants whose enthusiasm for and interest in the herbs industry was contagious, and she began thinking more about using medicinal herbs as an alternative medicine for various ailments. Maysaa’ received a grant for her business idea to make natural medicinal soap from various organic herbs and oils. With the grant money she bought materials, tools, and marketing supplies to set up her workshop and business. The Youth Agribusiness Partnership initiative facilitates joint cross-border agribusiness enterprises through small grants and technical assistance, and promotes reconciliation through cross-border cooperation. As such, NEF helped Maysaa’ find a suitable business partner from Israel with similar ambitions. She and Mazen, her Israeli business partner, decided to collaborate to expand her herbal/medicinal soap business. Reflecting on her participation in the project and establishment of her small business, Maysaa’ says she has already achieved great success, simply because she is a single woman operating in a conservative community. Thanks to her vision, diligence, and determination, Maysaa’ is producing more than 10 types of therapeutic soaps that treat various skin and hair conditions. Read more about our work in the Palestinian Territories.